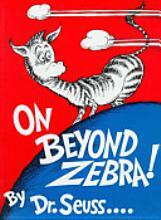 On Beyond Zebra, by Dr. Seuss, serves as a great testimony to the mysteries and surprises of life! The main character in this supposedly nonsensical tale is a boy who contends that there are many more letters in the alphabet than we commonly use. He proceeds to describe these letters (that follow after z for zebra) and the phantasmagorical creatures whose names begin with said letters, such as the letter wum for wumbus. This book serves as the expression of my journey with our heavenly Father! On Friday, our fifth and youngest child will graduate from college. Since we have had one, two, or even three children in college for fourteen years, this graduation truly marks the end of a significant era in our lives. Although our budget is looking forward to relaxing a little, we actually are experiencing nostalgia rather than jubilation as the day approaches (along with a tremendous surge of gratitude!). There was a time when I feared I would never have any children. Then I was afraid that, although I knew I would LOVE them, I might not LIKE them. Miraculously, against all apparent odds, I conceived and even had five beautiful babies. Again, quite amazingly, I actually LIKE our children! I enjoy their quirks and idiosyncrasies, their sometimes off-beat likes and dislikes, and I love talking with them about their lives. We were naturally concerned about their education and managed to pray our way through public school, private school, and even home school (which I had sworn I would never undertake and ended up loving!). We watched sporting events and piano recitals and ballet performances, participated in various experiments and proofread a multitude of term papers. We navigated the turbulent rapids of life on our family raft and hung on with prayer and a few squeals of fear and delight in the process. Suddenly, that era is now drawing to a close, and we are truly done with child-rearing. However, as I look back over the years, I feel as though God has absolutely gone “on beyond zebra” in His outpouring of goodness and grace toward us. I could never have dreamed I would have so many children or enjoy them so very much. I could never have imagined how we could help all of them through a university-level education on one income (not mine!) and survive the purported perils of the teenage years (one of my favorite seasons, as it turned out!). I never imagined that it would even be possible to have the privilege of being so proud to have five faith-filled children of character who are concerned about the integrity of their walk with Jesus Christ. Moreover, I KNOW I did NOTHING to deserve this storm of blessings that we have received — other than grab God’s Hand! His love is beyond our wildest dreams in length, breadth, height, and depth (Ephesians 3:18-19). We cannot possibly conceive of the things He has prepared for us (I Corinthians 2:9).